The times they are a-changin’ at Microsoft, (S MSFT) and we are not just talking about the company’s executive leadership: Xbox Music, the company’s Spotify-like music subscription service, is launching on iOS and Android Monday, making it the first Microsoft-owned entertainment service to launch on the two leading mobile platforms. And speaking of firsts: Microsoft is also debuting free, ad-supported music streaming on the web. 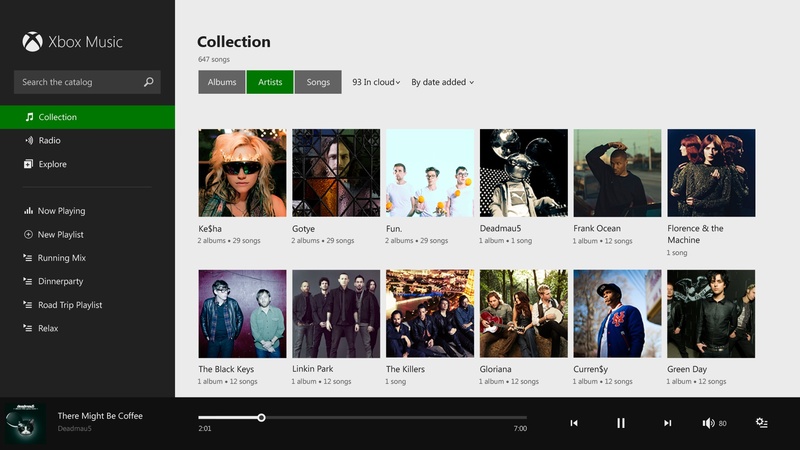 Microsoft tried to make a big splash with Xbox Music last year, when it unveiled the service as an ambitious take on Spotify with a bold design, Xbox branding and Smartglass integration. However, the attempt to create a unique experience across multiple screens didn’t really click with consumers, and some of the Windows 8-influenced design choices actually made using the service pretty difficult. That’s why the Xbox Music team went back to the drawing board to simplify its service. The result is something that looks a lot more like the competition, and that may actually be a good thing: Instead of just tiles, there is now a left sidebar navigation, and a section previously called Smart DJ is now simply called Radio. Turns out using terms that people are familiar with actually helps to drive up usage. Check out a website that lists a bunch of artists, like the line-up of a festival or an article on a music blog, and Windows 8.1’s upcoming Web Playlist feature will let you turn all that unstructured data into a playlist with two or three clicks. I got a preview of this feature during a meeting with the Xbox Music team last week, and it’s actually pretty cool. Speaking of which: Amazon, Google and Apple all offer their customers some kind of cloud locker to store previously purchased music, including tracks they have ripped from CDs. Microsoft now wants to take yet another cue from those offerings and eventually add a locker like this to Xbox Music as well. A cynic might argue that this will make the service look even more like the competition — but one of the lessons of the Xbox Music reboot may be that to have a fighting chance in digital music, you need to have the humility to be on the platforms that people use, and offer the features they want. And Rhapsody was out for years before that. Somehow Spotify has basically won the race anyway. ‘humility’? *sigh* Xbox Music was always going to be cross perform ala MS’ other products. Hey I wanna download! The app! Androids!